This was an album nobody expected. Most had accepted that "Reality" would be the final studio album from the now-reclusive, not too healthy David Bowie. Just when many seemed to feel he had retired, almost unheralded, he put out this remarkable album. It had been recorded, almost in secret, over the previous few months. Personally, it is by far my favourite of the post-1990 albums. No question. This is a special album. I am not sure about the cover though, slapping the title over the old "Heroes" cover. That doesn't work for me. I would rather just a plain white cover and the title in black. That is a minor point, however. The infectious, strident title track is instantly likeable. For me, it has echoes of "87 And Cry" and "Time Will Crawl" from 1987's unpopular "Never Let Me Down" and also a vague feel of some of the short tracks from "Low", if they had been extended. A favourite of mine is the solemnly atmospheric "Dirty Boys", with its lyrics that in many ways seem to hark back to the late sixties material. "The Stars (Are Out Tonight)" is an energetic, upbeat, rhythmic number with hints of some of the "Reality" material about it, but the acoustic guitar underpinning it takes us way back to the early seventies. 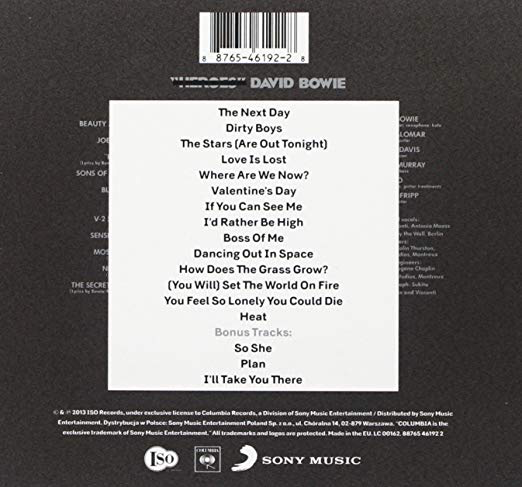 "Love Is Lost" is a huge track, with a thumping slow drum sound, menacing keyboards, industrial guitars and a sonorous Bowie vocal, together with portentous lyrics. It is a magnificently inscrutable yet stimulating song. Imagine this on "Heroes". A true latter-day Bowie classic. The haunting, mysterious "Where Are We Now" evokes Berlin once more, speaking of Potzdamer Platz in a hugely atmospheric, slowly grandiose song. 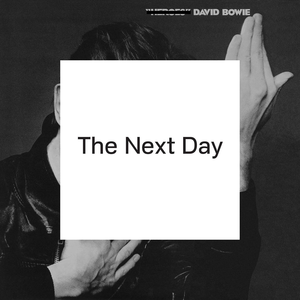 Let's be honest, Bowie hadn't put out stuff like this that made your spine tingle like this for years. Yes, there had been good material on the last thirty years of albums, of course there had, but anything like this? Maybe not. I remember listening to this and feeling a real excitement over a Bowie album for the first time since "Scary Monsters". 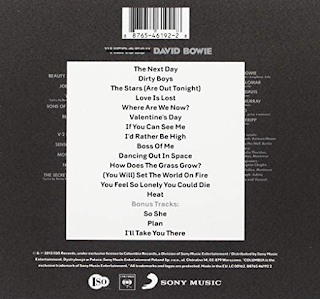 That is not to say I didn't like the others, I liked many of the, but this album seemed very much like a David Bowie we had not heard from for years returning. "Valentine's Day" is another corker. Backed by some rock 'n' roll "la-la-la" backing vocals, some excellent rock guitar and featuring some perplexing lyrics about someone called Valentine, whose identity we never knew. The dance music rhythms experimented with on "1.Outside" and "Earthling" return for the frantic, beats per minute, "If You Can See Me". Lyrically, however, it is much stronger than some of that material, particularly that form "Earthling". The remarkable thing about this album is that great tracks just keep coming. There isn't a duff track on it. The catchy "I'd Rather Be High", with its dreamy sixties-influenced parts, is another one. It has a great melodic guitar riff too. "I stumbled to the graveyard and I lay down by my parents..." is a moving line from what is a largely autobiographical song. The addictive "Boss Of Me" has Bowie singing over a staccato, low saxophone-influenced tune about a female boss, oddly. At this point, it is worth noting that the sound is truly excellent throughout this album - clear, warm and bassy. This song provides a good example of that. The jaunty "Dancing Out In Space" keeps the quality coming with another one with "Reality" echoes. It is also impossible catchy too. "How Does The Grass Grow?" has a searing "Heroes"-style guitar intro which continues throughout this pulsating, rocking track. It ends with some "Low"-style bass on the fade-out. "(You Will) Set The World On Fire" is an upbeat, singalong number that reminds one of the "Diamond Dogs" era, slightly. "You Feel So Lonely You Could Die" is beautifully anthemic and, considering the near future, extremely sad. Musically, it has a sumptuous bass line. It ends, again sadly, with the introductory drumbeat from 1972's "Five Years". There are echoes of "Rock 'n' Roll Suicide" throughout the song too. The album ends with the somnolent "Heat", with its evocative, beguiling lyric about "my father ran the prison". Was he referring to his own father, or merely writing an observational song? The latter, apparently. The "bonus tracks" feature the sixties guitar riffage of the energetic "So She"; an intoxicating instrumental in "Plan" and the effervescent guitar-driven rock of "I'll Take You There". All these tracks are up there with those on the actual album. The pounding electronic rock of "Atomica" from the extended "Next Day Extra EP" is excellent too, as is "The Informer". There are some entertains remixes too, particularly "I'd Rather Be High (Venetian Mix)".